Posted On September 23, 2015 by Team iCynosure. Many Indians identified with when Ranbir Kapoor and Deepika Padukone dated but then when they parted ways hell broke loose. One of the biggest concerns was that audiences may never see this gorgeous, now on-screen couple on celluloid again. Blame this on the yesteryears stars who set the trend. However that doesn’t hold true for these stunning ex-lovers turned friends who are so comfortable with each other that it spells magic in all their outings, whether film or otherwise. 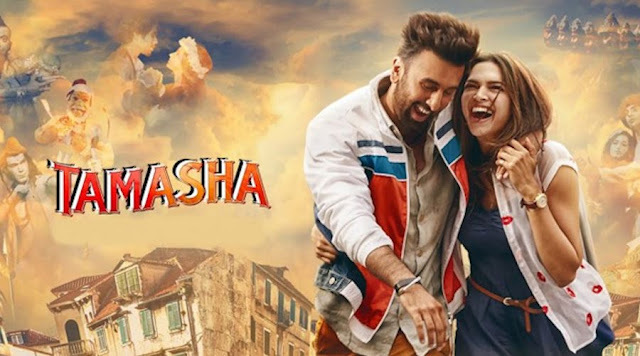 We have been waiting with bated breath for the release of their new film together Tamasha. And while the film is yet a few weeks away from hitting the silver screen we were fortunate enough to be at the Trailer Launch and just couldn’t get enough of all the Tamasha happening. Silly questions by jurnos to fun vibes between the lead pair to the inspiration disclosure by the ever-so intense Imitaz Ali, it was a fun afternoon with so much awesomeness around. Of course we are talking about the on-screen couple who when parted ways broke more than a million hearts. However the chemistry, the camaraderie and the love is there for everyone to see. If you really miss it, you are not only blind but also inhuman. Together they are a riot and the box-office is surely going to fall in love with them, during their first outing after the breakup. Take any Ranbir-Deepika film and you know what I’m talking about. Very few words can describe love and magic that these two love birds create for the audiences. It is difficult not to feel what they are portraying on screen. Every frame on the trailer shows the talented duo create an mesmerising chemistry that needs to be seen to be believed. With a line up of films that emotionally connect with the audiences from Socha Na Tha to Jab We Met and Love Aaj Kal to Rockstar and Highway; Imtiaz Ali has done what very few directors can do. Transform the stars into actors who geninuinely take the audiences on the roller-coater ride. So sit back to drink the same wine from a new bottle that adds a definite shape to the drink. A R Rahman and Imtiaz Ali the combo behind Rockstar and Highway, just a blip at the launch and we are waiting. Need I say more? With so much riding on her, Deepika has in the last few years not disappointed her fans at all. With the beauty, grace and pure talent she has taken top spot and ruled the cinema world with her classic sophistication. Every time she is in the frame, it magically lights up and all eyes are transfixed on her. Her scenes in the trailer takes one’s breath away, especially the last scene, though very similar to her earlier outing with Ranbir it is spectacular. Tamasha in a way is trying to decode the relationship and who better than these ex-lovebirds to pay the part that makes it seem like reality. Until the film release on November 27th, serenade yourself with A R Rahman's music and catch the trailer here.